The Central Texas Conference Mid-Winter retreat is a time for rejuvenation and reflection for youth in grades 6-12. Youth groups from far and wide come to participate in the activities and worship. Traditionally, Mid-Winter has been held at Glen Lake Camp. However, in response to requests to add another location for those who just can’t make it to Glen Rose, a second Mid-Winter retreat was added for 2013 at the Waco Methodist Children’s Home. While both retreats will happen on the same weekend and have the same theme, the Waco Mid-Winter is trying out a modified format that offers the youth the opportunity to do some mission work along with the excellent fellowship and worship. During the Mid-Winter in Waco, the youth will get a chance to give back and do mission work for the Methodist Children’s Home. This is the first time that CCYM student leaders have partnered with the Methodist Children’s Home in this capacity. The new partnership is another chance to continue the mission to make disciples of Jesus. This new opportunity allows the youth of today to give back in service and transform the world. And the response to the new format for the Waco Mid-Winter Retreat has been outstanding. In fact, the second location and modified format have been so well received that the retreat is already full! The kids seem excited to have the opportunity to go to Waco and continue to illustrate that this is a generation of action and commitment. 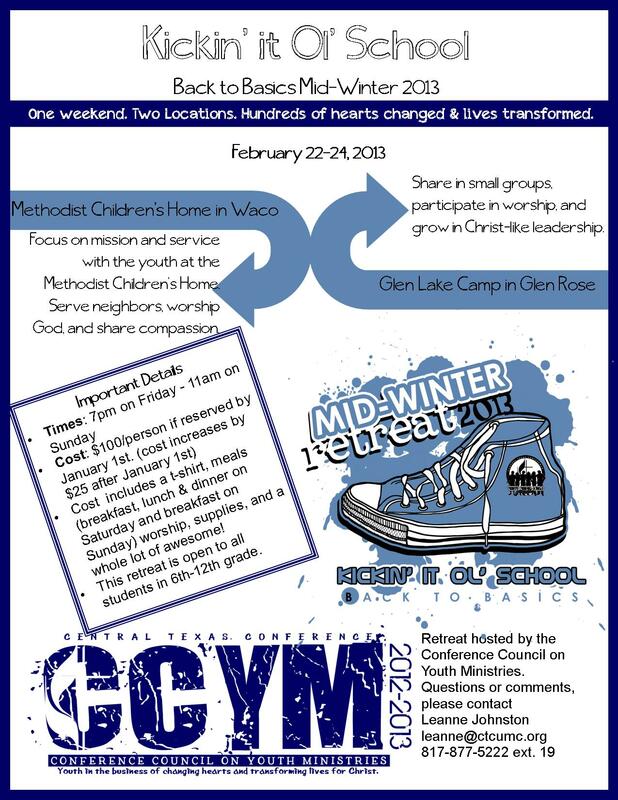 The youth heading to Glen Lake for their Mid-Winter retreat are also eager and enthusiastic about the 2013 gathering - one that promises to be full of fun and worship as it has for decades. The Glen Lake Mid-Winter offers kids the opportunity to be in fellowship with other churches while breaking up into small groups and participating in the lessons prepared and led by students. There is still some availability for the Glen Lake retreat. For more information and to register your group for the Glen Lake Mid-Winter retreat, please visit the Mid-Winter 2013 page on ctcumc.org. The theme at both locations is “Kickin’ it ol’ school.” Speakers and small group curriculum will be focused on getting back to the basics of our faith and strengthening discipleship. The speaker and band for the Methodist Children’s Home is Julian Hobdy from Campus Drive UMC and Bus 7 from Waco. For Glen Lake the speaker is Rev. Danny Tenney from Richland Hills UMC and the youth band from Alliance UMC in Fort Worth. Don’t forget to check back here after the Feb. 22-24 events for stories from both locations about the event as well as tales from some of the hundreds of young hearts and lives that’ll be energized and transformed during Mid-Winter 2013. CLICK HERE FOR INVIDUAL REGISTRATION!